Despite how it may seem from my intermittent posting during the latter part of last year, and this being my first post for 2013, I have been keeping busy with taking and editing photos, and with visiting many galleries already this year. I spent a month during December and January visiting my partner, our respective families, and friends back in Australia, with quite a lot of jumping about from place to place. During my travels I took quite a lot of photos of Winton, Queensland, and surrounds, where my partner's family lives and where he has spent a large part of his life, and quite a few snaps of him. I'll post some of the photos of landscape and fauna I captured whilst I was there on here soon, though I didn't take my usual glut of photos whilst away, and none of them were self-portraits. The heat and injured / painful feet (long story) hindered me, and it was also good to actually have a proper holiday. Since my return to London I have been catching up on seeing a lot of art (I will try to post about some of that on here), and have also been trying to catch up on my backlog of editing. Last year I finally finished working my way through photos from a road trip with Natasha Wheatley in 2009; and I'm currently working my way through photographs from the road trip I took with Philip Ivens from Melbourne to Brisbane in 2010. 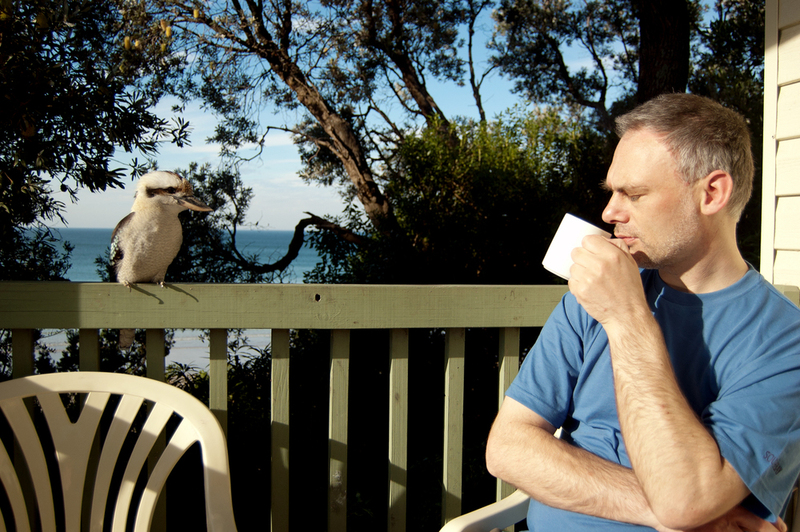 Below is a sequence of images I took of Philip 'in conversation' with a visiting kookaburra on the verandah of the cabin we stayed in at Waratah Bay on our first night out of Melbourne. At the bottom is an animated gif of the five images, because, well, I just couldn't help myself. Phil was not buying it. I realised a few years ago, when standing on the bench in my bedroom to paint the higher sections of the wall, that I'm not specifically afraid of heights. I'm afraid of falling. Therefore, one metre off the ground I can go into panic mode. Walking down a spiral staircase I manoeuvred my way up without thought suddenly becomes a job undertaken in a crab-like posture (just ask my ex about such experiences in La Sagrada Familias and Caernarvon Castle). 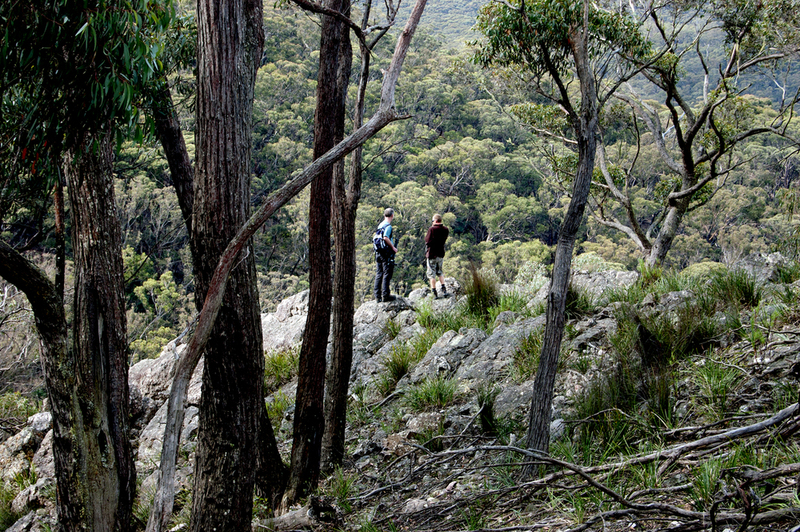 An attempt to venture onto The Balconies in the Grampians National Park had me experiencing vertigo - feeling as though everything below was moving and whirling, and I had to drop to the ground to feel like I wouldn't fall off the edge. So I ventured as far as I could with Phil and Aaron at Shady Rest. They walked to and stood at the furthest edge of the property at that point. I had to stop short from nausea. The best I could manage was to photograph them standing there, as though they were waiting for a bus, or an elevator, or something equally innocuous that doesn't involve falling to their death. It sounds dramatic to say that, but every second day on the stairs in my house I almost over-balance from this fear of falling. I almost did today.